Ancient Wisdom, Modern Kitchen Blog: We Won! 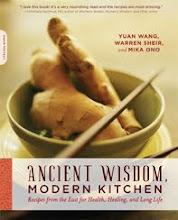 Much to our surprise and delight, Ancient Wisdom, Modern Kitchen won Best Cookbook in the 2011 San Diego Book Awards! We're thrilled by the honor. An extra thanks to the San Diego Book Award Association and everyone who supported the book from conception to completion! Congratulations, you guys. How wonderful! I love getting some of your ancient wisdom in class...honored to be a student.